A Windsor, Ont., city employee’s comments involving guns and his co-workers were sufficient to warrant his dismissal, an arbitrator has ruled. Terry L’Esperence worked for the City of Windsor for 10 years, most recently in the traffic operations department repairing and replacing road signs. Before joining traffic operations, he was a carpenter for the city and was moved to traffic operations after some downsizing. From the beginning, he didn’t like his new position and considered it a drop in status. 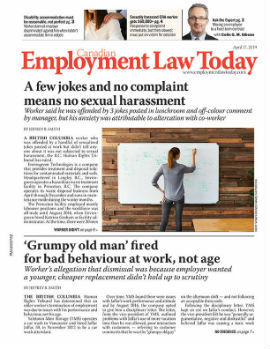 L’Esperence’s discontent showed through in his attitude towards his co-workers in the traffic department, often referring to them as “flunkies.” This attitude did not go over well with other employees or his superiors, and in August 2010 he received a four-week suspension for “displaying unprofessional and inappropriate behaviour toward fellow employees by swearing at them, calling them inappropriate names and making demeaning comments.” An agreement between the city and the union reduced the suspension to three days.